Strain curd using muslin cloth to get silky texture. Add chopped beetroot along with salt and black pepper powder. Whisk everything well to get pink color in dip evenly. Keep in refrigerator for half hour before serving with a plate of appetizers!!! Adjust the salt level as per your taste. Keralites have a similar dish called Beetroot pachadi. Hope you will try both the beetroot recipes and will share the outcome with us. If you know a beetroot recipe, we don’t have, feel free to share it. This entry was added on September 28th, 2013 by SJ in Chutneys and Dips and tagged with Quick Dip, dips, easy dip recipes, beetroot dip, yoghurt. Last revised on April 4th, 2018. Looks yummy. Love the colour. That looks so smooth. Lovely color Sj. 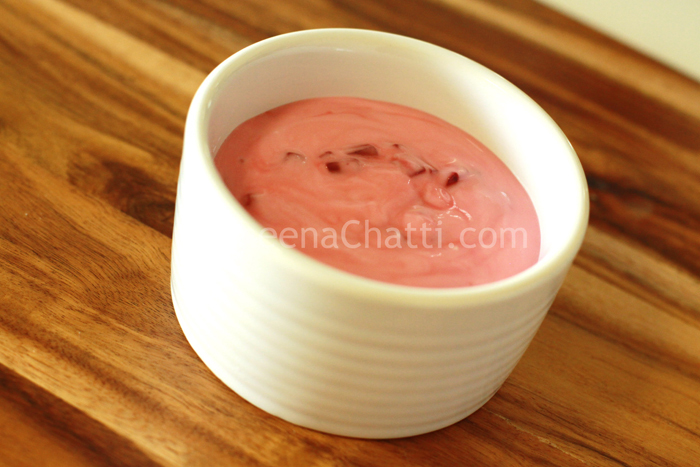 We have also a similar preparation in South India Sj – Beetroot pachadi, the recipe is available here in CheenaChatti itself.